In picking up and holding John Delly’s new book Essentials of Polarized Light and Ancillary Techniques, you will quickly notice that this work is heavy, literally; it weighs over five pounds and measures more than an inch and a half in total thickness. 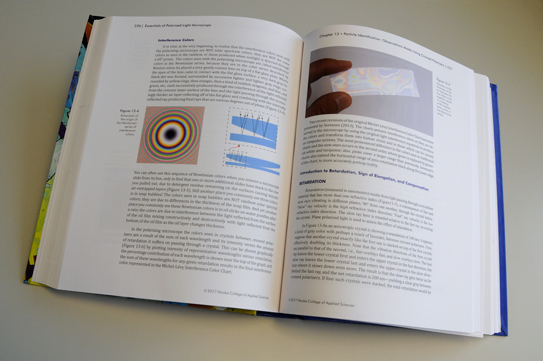 A book with this kind of heft contains far more than just the essentials of polarized light. Anyone who has ever met John has most likely experienced his encyclopedic knowledge of microscopy; thus, the assumption that this book would be nothing less than comprehensive is to be expected, even if in his opinion it is just the essentials. As the author points out in the book’s preface, this work grew out of a need on the part of Hooke College of Applied Sciences, a member of The McCrone Group, for a suitable modern textbook for use in their microscopy courses. The book is definitely modern in the sense that there hasn’t been anything quite like it published previously. The contents are a unique comingling of historical references and techniques, while also using the most modern microscopes available as examples throughout the book. The book is divided into twenty chapters, with many topics revisited throughout, but presented from slightly different perspectives, depending on where one is in the book. This structure works well as both a continuous read (cover-to-cover), and an exploration of individual chapters, which stand on their own. The first three chapters are short in terms of actual text, but dense with color photomicrographs and pictures of equipment. It’s as if John is letting the reader dip their toe in the water before plunging into the deeper topics covered later in the book. Nearly every page contains color photographs, illustrations, tables, callout boxes, colorful diagrams, warnings complete with caution tape, and useful equations for microscopists. Most chapters end with reference material to keep both beginner and veteran microscopists reading for years to come. There are Further Reading lists at the end of most chapters. These are useful because you would be hard-pressed to find another resource where just about every relevant book on that particular chapter subject has been succinctly organized for you. But beyond that, the author has also annotated a number of these sections, giving reasons why the reader should consider exploring a specific work. The most highly recommended books are marked with an asterisk. I have included the length of the Further Reading list section in number of pages at the end of each chapter review. The next four chapters in the book are The Polarizing Microscope, Mechanical Alignment of the Polarizing Microscope, Setup of Köhler Illumination, and Micrometry and the Calibration of the Eyepiece Micrometer. As one would expect, these chapters closely follow what a student will cover during the first day or so of a polarized light microscopy professional development class, or the first couple of weeks in a semester-long course. The remaining chapters are what really set this book apart from other works. It’s John’s one-of-a-kind lifetime of applied practice and scholarship from diverse areas of microscopy that guide the reader. He has done the hard work of culling the most important and relevant pieces of information and references, and serves up these topics from a truly unique perspective to the reader. The structure of this chapter reminds me of a boot camp workout: material becomes increasingly more difficult, but by reasonable degrees, which keeps your interest by circling back to previous topics. It is also written for people who are not geologists, and John explains his reasoning behind this in Appendix C. As a reader, I found Appendix C extremely informative, and in my opinion, it might be the first place one should start when setting out to read this book. In Appendix C John takes the reader on a fascinating historical tour of terminology and symbols used throughout the years by crystallographers, and puts the reader at ease, helping to make sense of a topic that can quickly become overwhelming and confusing to the beginning microscopist. Further Reading list measures three pages. 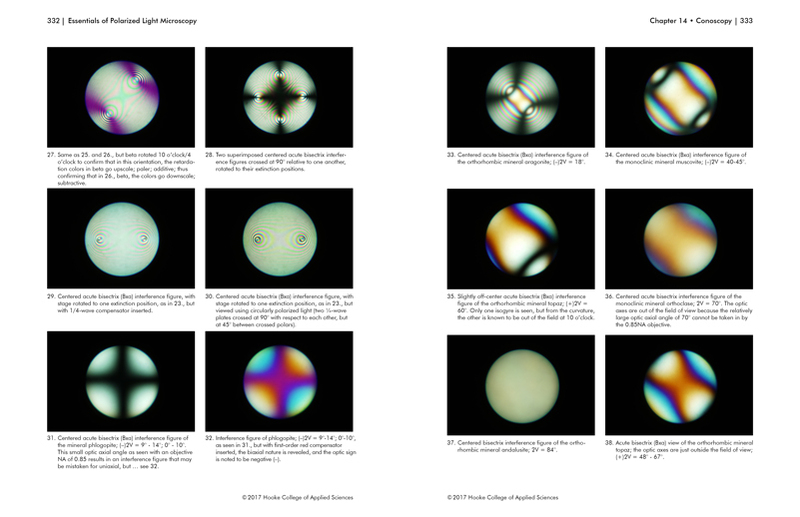 This chapter not only covers the basic optics of the light microscope, but also discusses how light travels through various polarizers, mounting media, and crystals. It’s a little bit of everything that is developed in greater detail later in the book. Further reading section measures one page. In this chapter no stone is left unturned with regard to sample preparation as it relates to the microscopist interested in particle identification. A thorough discussion of different kinds of mounting media, historical references, and the use of important tools and instruments is presented. For do-it-yourself (DIY) users, there are numerous examples of items that can be purchased, or even made, by the student. 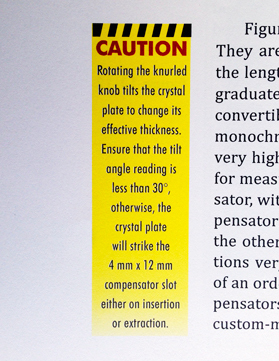 There is also a section on aqueous mounts, and how to use a slide-ringing turntable. These three chapters provide the reader with a systematic approach to using the polarized light microscope for particle identification. John starts with simple observations through ordinary light, including size, shape, and absorption color. He then moves through inserting a single polarizer into the light path, making refractive index determinations, and using dispersion staining. Finally, he explains adding a second polarizer to measure birefringence, and selecting the proper compensator, along with a whole host of accessories. Further Reading section measures nine pages. Similar to the rest of the book, there is no shortage of colorful pictures and illustrations in this chapter. There are the requisite interference figures and indicatrix models, but it is the author’s conversational writing style that again puts the reader at ease with an approach that is definitely from a particle analyst’s viewpoint. The chapter concludes with a discussion about biological specimens, and an unparalleled interference image gallery. The reference section of this chapter is extensive and includes occasional annotations. Further Reading section measures four pages. With no apologies made for old-school techniques, obviously a subject near and dear to John’s heart, he makes the case for including this chapter of dying art techniques as being rapid, inexpensive, and useful in remote locations; as when one is away from the laboratory (field tests). For these techniques, the author reminds us that microchemical tests can be carried out with the most basic of microscopes. Towards the end of the chapter there are laboratory exercises along with nearly six pages of references. The Further Reading section measures seven pages. 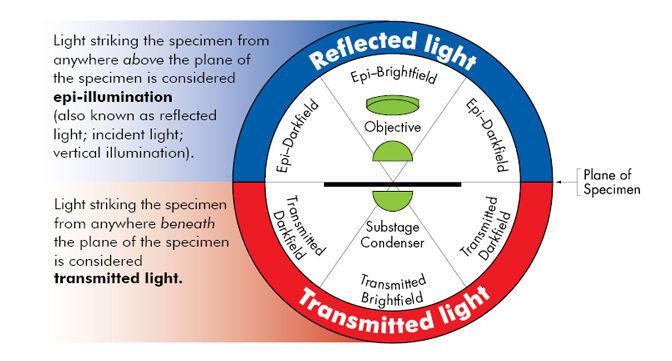 Again from the particle analyst’s viewpoint, the author considers fluorescence microscopy to be one of the most useful ancillary techniques in the application of particle identification. This chapter includes a section on naming and locating the parts of the mercury burner, along with a complete step-by-step guide on centering and aligning the mercury burner. This chapter begins with a common microscopist’s dilemma: When the refractive index of your sample matches the refractive index of the surrounding mounting medium, what can you do to see the sample? Thankfully, there are many options, and John explores some of the most common ones. As in other chapters, there are several opportunities for the DIY crowd. This chapter has detailed instructions on how one would go about making inexpensive accessories to obtain transmitted light darkfield, and Rheinberg illumination. I also found the section on the four great classes of illumination interesting—in particular, the concise schematic diagram that resembles something of a scouting patch. It is a great way to visually explain these contrast methods to someone who is unfamiliar with the techniques and terminology. The Further Reading section measures two pages. This chapter is a real treat and a time saver for those who take John’s advice in using slightly uncrossed polarizers and parallel polarizers, but only after traditional basic polarized light practices have been mastered. There is also a comprehensive historical overview section in this chapter on thermal microscopy methods, which includes a list of hotstage experiments from Ludwig Kofler. The justification for a section on immersion objectives stems from a couple of real world cases where the incorrect use of an immersion objective had resulted in poor images. The culprits of these bad images were incorrect coverglass thickness and using too much mounting media for the sample. At high magnifications, these seemingly trivial considerations usually become major hurdles when using these unforgiving objectives. John explains step-by-step how to use these lenses correctly. This chapter is great, and made me eager to keep reading. Brought to its logical conclusion, this is the part of the book where the reader gets inside John’s head, and follows along as John systematically works through example samples…isotropic, uniaxial, biaxial—like Sherlock Holmes explaining how he arrived at a solution. So cool! This is also the place in the book where you will find the practical applications of the charts and tables from other reference volumes. The Further Reading section measures seven pages. There are a total of four practical laboratory exercise sections sprinkled throughout the book. They are great for individual users to try out on their own, or for instructors to use in more organized environments like the classroom. 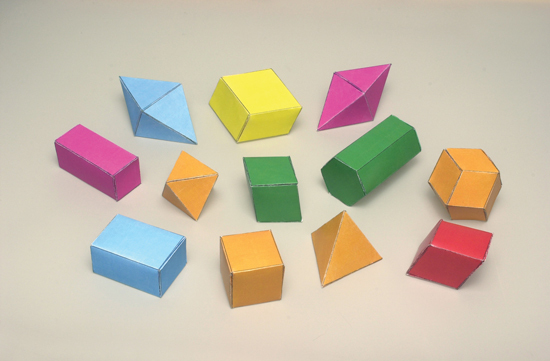 The topics range from Köhler illumination, to making paper crystal models, to light box experiments in polarized light microscopy, to microchemistry and spot testing. 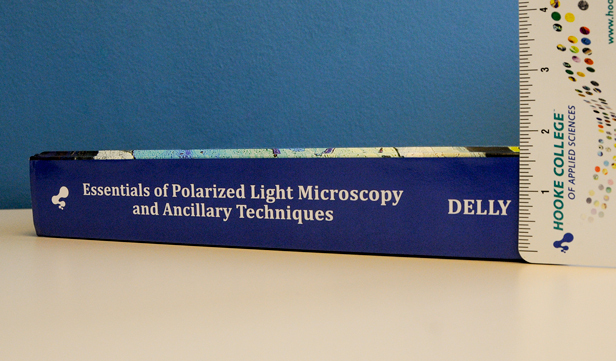 The Essentials of Polarized Light and Ancillary Techniques is the closest thing to capturing a lifetime of John’s microscopy experience in one handy volume. Enjoy your journey through this must-have book. This appears to be an excellent basic text. I am adding it to my library. Thank you, Russ. We appreciate your trust and support. Please let us know what you think after receiving and reviewing the book.